Battambang, Cambodia, August 2018 – In Cambodia, many families live below the minimum wage of about $5 a day and women and children are some of the worst affected by poverty in all its forms. As a UNICEF monitoring and evaluation officer, my job involves collecting and analyzing data to inform decision making regarding how best to meet the needs of children who live in disadvantaged communities. This mission was a ‘reality check’ with local government officials to discover how they meet the basic needs of women and children. We were required to learn how effectively commune council members and social workers dispatched by the committees for women and children (CCWCs) were able to deliver key services including: maternal child health and nutrition, education, and support for people affected by natural disasters. To do this we examined the planning, selection of priorities, and approval of the commune investment programme. Our findings will be used to establish a baseline for social service delivery at the local level, by assessing the proportion of commune funds going toward social services, early childhood education, water and sanitation, and would also lead to the identification of constraints and opportunities to delivering much needed services. This would inform recommendations and advocacy efforts to improve national-level initiatives that better address the needs of Cambodia’s most vulnerable groups. 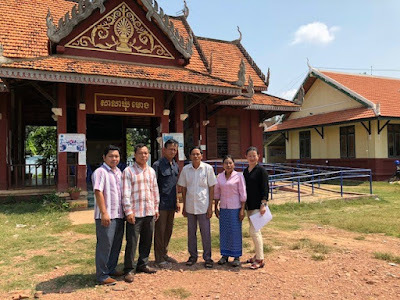 On a hot Monday afternoon, I travelled with UNICEF colleague Savy Bou, Communication for Development officer, to Battambang Province in north-western Cambodia, where we joined the data collection teams of three rural districts. Within a week, we held face-to-face discussions with commune chiefs, deputies, CCWC representatives and clerks. In Pech Chenda commune, I joined Keo Chetra (MOI staff) in an interview with a deputy commune chief, while Savy and a MOI colleague interviewed the others. At the commune office, I observed Chetra use the adapted questionnaire to generate the most useful and meaningful responses. Through our interviews we learned that leaders of the communes understood the importance of investing in social services, but they expressed that limited budgets and a complicated process made allocating funds challenging. Some communes are unlikely to spend on social service priorities that cover the costs for education kits (e.g. uniforms, bags and textbooks) or bicycles for poor students because they are unaffordable or as a result of a cumbersome process. One particularly memorable interview was with Seb Sokheang, a representative for women and children of Ta Sda commune. Seb joined the council less than two years ago, and in that time, she has developed a good understanding of the needs of her constituent and is actively seeking the implementation of social services that will best serve her community. Seb explained that the elected council members are responsible for monitoring the implementation of social services and reporting on developments to council. “In my commune, we spent about 11 million riels (equivalent to US$2,750) last year on social service activities, including stipends to community preschool teachers and materials for their classes, water filters to poor families and support for victims of natural disasters,” Seb said. 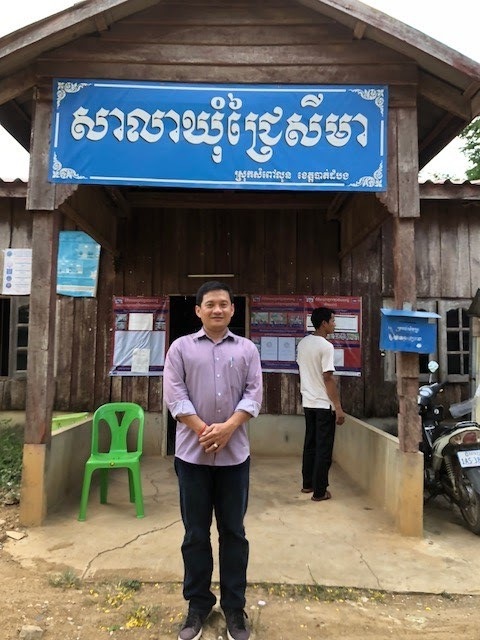 In a career spanning nearly two decades, Chheng Kimly has worked his way up from clerk to deputy chief of Moung Roussey commune. 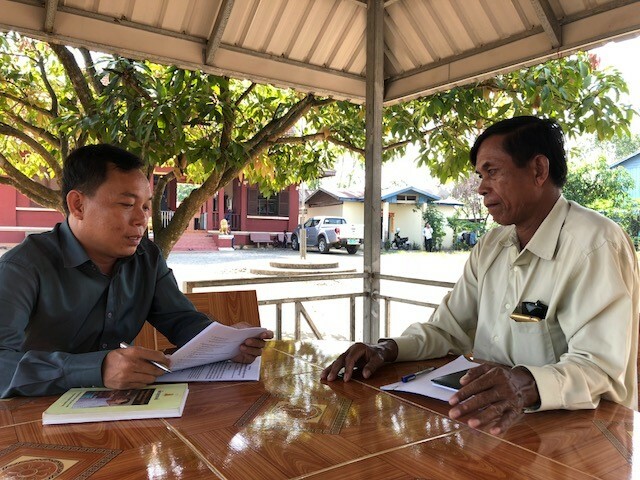 In my interview with him I discovered just how resourceful and well informed he is about social services Chheng proudly listed the commune’s social services track record in 2017; transport fees to health centres were given to vulnerable pregnant women and children with disabilities, poor families were given food and families affected by natural disasters were supported. Even though social service is a priority, the commune still receives very little funds to respond to the overwhelming needs of its constituents. However, Chheng was confident that as the commune’s budget increases, the council will grant more funding to social service interventions. Looking to the future, the survey explored the idea of introducing smartphones to collect data in communities. This would allow data collectors to easily save or adjust responses electronically. “It would be a simple and easy tool to apply in the survey because I would not need to be an IT expert to operate the mobile application and internet connectivity is not needed,” said one MOI data collector. Savy, who administered the survey, added that smartphones bring greater effectiveness and efficiency and help save time in data collection and analysis. Partnering with MOI to collect data for this survey helped strengthen MOI research skills, while also establishing a good baseline that enables monitoring and assessment throughout social service implementation. The baseline also indicates if a project designed to increase the number of children aged 3-5 attending preschool or number of households with access to safe and clean water, for instance, is meeting expected outcomes. The baseline will help UNICEF to review and finalize the Social Service Implementation Manual which is a practical tool to support commune councils and relevant stakeholders to implement social services for children, especially the most disadvantaged. UNICEF continues to work with MOI to improve better social service results for children and women, especially the most disadvantaged. Phaloeuk Kong is a monitoring & evaluation officer with UNICEF Cambodia.